I am very happy to announce that I have been selected for the Pro Hart Outback Art Prize, Broken Hill Regional Art Gallery, for a fourth time. The title of the entry is ‘Live Bombs, on the edge of the Upper Spencer Gulf’, 2018. It is a mixed media piece on canvas, incorporating paper collage, as does my other works from the Cut Up Landscape series. 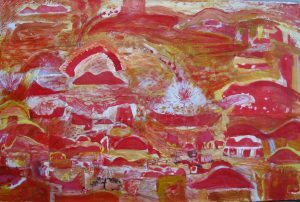 After ten years of experimentation, I see my early outback landscapes emerging in my work. 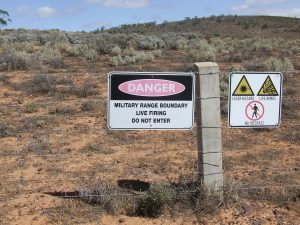 The reference to live bombs comes from spending time at a remote shack on the edge of the Upper Spencer Gulf. This precious spot is bordered by the Cultana Training Area, where artillery and air delivered weapons are tested. Sometimes, the background to the serenity of this location, would be the sound of bombs exploding. At night flares shoot into the sky for their night time training manoeuvres, so bright the shack and the mangroves would be lit up on the edge of a dark sea. I would wonder at the unseen places being smashed to smithereens. As part of my ‘cut up landscape’ series I started incorporating little landscape explosions into my works.